Megalosaurus bucklandii, the first non-bird dinosaur recognized by Science. July 2016. 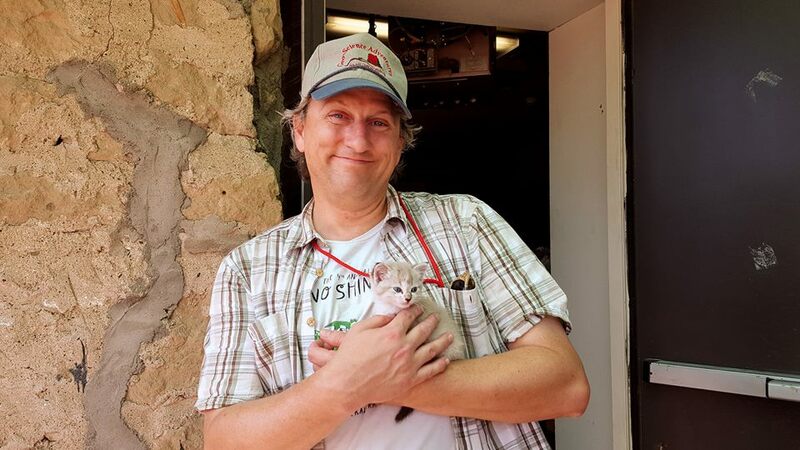 Felis catus, with Homo sapiens for scale. July 2017. Holtz, T.R., Jr. 2018. Evolution: New branches on the alvarezsaur tree. Current Biology 28: R941-R943. Holtz, T.R., Jr. 2017. Nomenclature: Share names for dinosaur divisions. Nature 545: 30. Farlow, J.O., T.R. Holtz, Jr., T.H. Worthy & R.E. Chapman. 2013. Feet of the fierce (and not so fierce): pedal proportions in large theropods, other non-avian dinosaurs, and large ground birds. Pp. 88-132, in J.M. Parrish, R.E. Molar, P.J. Currie, and E.B. Koppelhus (eds.) Tyrannosaurid Paleobiology. Indiana University Press. Brett-Surman, M.K., T.R. Holtz, Jr. & J.O. Farlow (eds.) 2012. The Complete Dinosaur. 2nd Edition. Indiana University Press. 1112 pp. Holtz, T.R., Jr. 2012. Dinosaur hunters of the Southern Continents. Pp. 107-118, in M.K. Brett-Surman, T.R. Holtz, Jr. & J.O. Farlow (eds.) 2012. The Complete Dinosaur. 2nd Edition. Indiana University Press. Holtz, T.R., Jr. & M.K. Brett-Surman. 2012. The osteology of dinosaurs. Pp. 135-149, in M.K. Brett-Surman, T.R. Holtz, Jr. & J.O. Farlow (eds.) 2012. The Complete Dinosaur. 2nd Edition. Indiana University Press. Holtz, T.R., Jr. & M.K. Brett-Surman. 2012. The taxonomy and systematics of the dinosaurs. Pp. 209-223, in M.K. Brett-Surman, T.R. Holtz, Jr. & J.O. Farlow (eds.) 2012. The Complete Dinosaur. 2nd Edition. Indiana University Press. Holtz, T.R., Jr. 2012. Theropods. Pp. 346-378, in M.K. Brett-Surman, T.R. Holtz, Jr. & J.O. Farlow (eds.) 2012. The Complete Dinosaur. 2nd Edition. Indiana University Press. Holtz, T.R., Jr. 2008. A critical re-appraisal of the obligate scavenging hypothesis for Tyrannosaurus rex and other tyrant dinosaurs. Pp. 370-396, in P. Larson and K. Carpenter (eds. ), Tyrannosaurus rex: The Tyrant King. Indiana University Press. France, C.A.M., P.M. Zelanko, A.J. Kaufman & T.R. Holtz. 2007. Carbon and nitrogen isotopic analysis of Pleistocene mammals from the Saltville Quarry (Virginia, USA): Implications for trophic relationships. Palaeogeography, Palaeoclimatology, Palaeoecology 249: 271-282. Holtz, T.R., Jr. 2006. Palaeontology: A Jurassic tyrant is crowned. Nature 439: 665-666. Holtz, T.R., Jr. & H. Osmólska. 2004. Saurischia. Pp. 21-24, in D.B. Weishampel, P. Dodson and H. Osmólska (eds. ), The Dinosauria. Second Edition. University of California Press. Holtz, T.R., Jr., R.E. Molnar & P.J. Currie. 2004. Basal Tetanurae. Pp. 71-110, in D.B. Weishampel, P. Dodson and H. Osmólska (eds. ), The Dinosauria. Second Edition. University of California Press. Holtz, T.R., Jr. 2004. Tyrannosauroidea. Pp. 111-136, in D.B. Weishampel, P. Dodson and H. Osmólska (eds. ), The Dinosauria. Second Edition. University of California Press. Holtz, T.R., Jr., R.E. Chapman & M.C. Lamanna. 2004. Mesozoic biogeography of Dinosauria, Pp. 627-642 in D.B. Weishampel, P. Dodson and H. Osmólska (eds. ), The Dinosauria. Second Edition. University of California Press. Holtz, T.R., Jr. 2003. Dinosaur predation: evidence and ecomorphology. Pp. 325-340, in P.H. Kelley, M. Kowalewski and T.A Hansen (eds. ), Predator-Prey Interactions in the Fossil Record, Topics in Geobiology Vol. 20. Kluwer Press. Farlow, J.O. & T.R. Holtz, Jr. 2002. The fossil record of predation in dinosaurs. Pp. 251-266, in M. Kowalewski & P.H. Kelley (eds. ), The Fossil Record of Predation. The Paleontological Society Papers 8. Holtz, T.R., Jr. 2002. Chasing Tyrannosaurus and Deinonychus around the Tree of Life: classifying dinosaurs. Pp. 31-38, in J.G. Scotchmoor, D.A. Springer, B.H. Breithaupt & A.F. Fiorillo (eds. ), Dinosaurs: The Science Behind the Stories, Society of Vertebrate Paleontology, Paleontological Society & American Geological Institute. Holtz, T.R., Jr. 2001. Arctometatarsalia revisited: the problem of homplasy in reconstructing theropod phylogeny. Pp. 99-122, in J. Gauthier and L.F. Gall (eds. ), New Perspectives on the Origin and Early Evolution of Birds: Proceedings of the International Symposium in Honor of John H. Ostrom. Yale Univ. Press. Holtz, T.R., Jr. 2001. The phylogeny and taxonomy of the Tyrannosauridae. Pp. 64-83, in D.H. Tanke and K. Carpenter (eds. 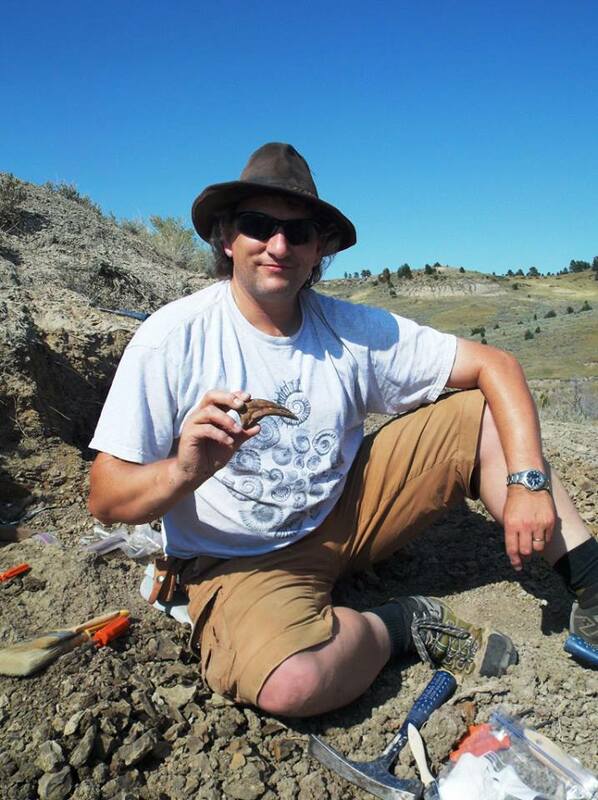 ), Mesozoic Vertebrate Life: New Research Inspired by the Paleontology of Philip J. Currie. Indiana Univ. Press. Farlow, J.O., S. M. Gatesy, T.R. Holtz, Jr., J.R. Hutchinson & J.M. Robinson. 2000. Theropod locomotion. American Zoologist 40:640-663. Holtz, T.R., Jr. 2000. Classification and evolution of dinosaur groups. Pp. 140-168, in G.S. Paul (ed. ), The Scientific American Book of Dinosaurs. St. Martin's Press. Holtz, T.R., Jr. 2000. Theropod paleobiology: more than just bird origins. Gaia 15: 1-3. Holtz, T.R., Jr. 2000. A new phylogeny of the carnivorous dinosaurs. Gaia 15: 5-61. Holtz, T.R., Jr., D.L. Brinkman & C.L. Chandler. 2000. Denticle morphometrics and a possibly omnivorous feeding habit for the theropod dinosaur Troodon. Gaia 15: 159-166. Padian, K., J.R. Hutchinson & T.R. Holtz, Jr. 1999. Phylogenetic definitions and nomenclature of the major taxonomic categories of the carnivorous Dinosauria (Theropoda). Journal of Vertebrate Paleontology 19: 69-80. Holtz, T.R., Jr. 1998. Spinosaurs as crocodile mimics. Science 282: 1276-1277. Holtz, T.R., Jr. 1997. Dinosaur hunters of the Southern Continents. Pp. 43-51, in J.O. Farlow & M.K. Brett-Surman (eds. ), The Complete Dinosaur. Indiana Univ. Press. Holtz, T.R., Jr. & M.K. Brett-Surman. 1997. The osteology of the dinosaurs. Pp. 78-91, in J.O. Farlow & M.K. Brett-Surman (eds. ), The Complete Dinosaur. Indiana Univ. Press. Holtz, T.R., Jr. & M.K. Brett-Surman. 1997. The taxonomy and systematics of the dinosaurs. Pp. 92-106, in J.O. Farlow & M.K. Brett-Surman (eds. ), The Complete Dinosaur. Indiana Univ. Press. Holtz, T.R., Jr. 1996. Phylogenetic taxonomy of the Coelurosauria (Dinosauria: Theropoda). Journal of Paleontology 70: 536-538. Holtz, T.R., Jr. 1995. The arctometatarsalian pes, an unusual structure of the metatarsus of Cretaceous Theropoda (Dinosauria: Saurischia). Journal of Vertebrate Paleontology 14: 480-519. Holtz, T.R., Jr. 1994. The phylogenetic position of the Tyrannosauridae: implications for theropod systematics. Journal of Paleontology 68: 1100-1117. All data matricies from Dinosauria. 2nd Edition. Holtz, T.R., Jr. (illustrations by L. Rey). 2007. 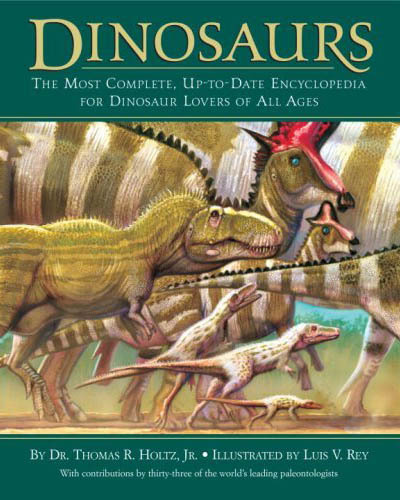 Dinosaurs: The Most Complete Up-To-Date Encyclopedia for Dinosaur Lovers of All Ages. Random House, 428 pp. Supplementary information (including chapter updates) available at http://www.geol.umd.edu/~tholtz/dinoappendix/. Wikipedia entry, and EvoWiki, too!